Edith Swanneck didn’t stand on the church porch with her husband Harold Godwinson. They exchanged vows at her father’s hall while clasping each other’s hands. Edith was a handfasted wife, recognized as Harold’s legal wife and the mother of his six children, but he could set her aside if he chose. Author Carol McGrath assures the reader that the couple is still in love, but as Harold rises in importance Edith Swanneck isn’t politically suitable for the brother-in-law of Edward the Confessor. Harold puts Edith Swanneck aside to marry Edith of Mercia on the church porch. In exchange he receives valuable support from Wales and Mercia. And Edith Swanneck is left to her own devices. When Edward dies on January 5, 1066, Harold becomes the last Anglo-Saxon king of England. It was a short reign. 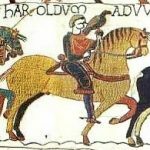 After repelling Harold Hardrada of Norway’s invasion of northern England, King Harold marches his army south to Hastings to meet William of Normandy. 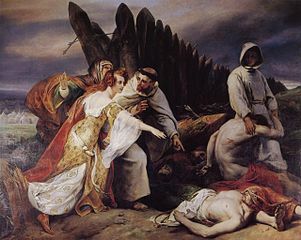 He dies on the battlefield on October 14, 1066. But who can identify his body among so many? Edith Swanneck goes to the battlefield to identify her husband and remove his body for formal burial. From these and other bare facts Carol McGrath weaves a tale of family life and trauma that is rich in detail about life in medieval manor halls. Little asides add up — maids sweeping and washing floors; everyday plain garments hung from rafters; linen bags filled with dried fennel to keep moths away. The story seems a bit cumbersome in places, but vignettes of daily life make up for it. 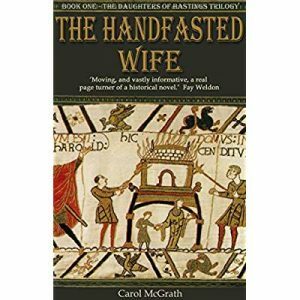 The Handfasted Wife (2013) was Carol McGrath’s first novel and Book 1 in the Daughters of Hastings Trilogy. The next two books focus on two of Edith Swanneck’s daughters. The Swan Daughter (2014) takes up the story of Gunhild of Wessex, the eldest daughter. The Betrothed Sister (2015) tells the story of Gytha of Wessex, Gunhild’s sister. The Handfasted Wife held my attention, but didn’t inspire me to read further in the family saga. 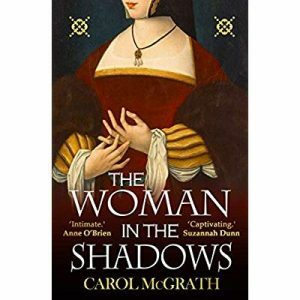 I did read McGrath’s most recent novel, THE WOMAN IN THE SHADOWS (2017). McGrath moves away from the middle ages to construct the life of Elizabeth Cromwell, wife of Thomas Cromwell whom you may have met in Wolf Hall. Hillary Mantel tells Cromwell’s story in incredible detail, while leaving his wife almost invisible. McGrath said Mantel’s work inspired her to bring Elizabeth Wykes Cromwell to life. Not much is known about her. Her father arranged for her to marry a Thomas Williams, a draper who was also a Yeoman of the Guard. McGrath indicates his romantic attention was engaged elsewhere. 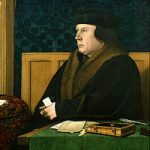 Widowed at age twenty-two Elizabeth Wykes tries to continue her husband’s business, and eventually gives up the struggle and marries Thomas Cromwell. McGrath said her goal was to introduce the reader to the lifestyle of the Tudor merchant class. Cromwell’s move into a political career is in its early stages when he loses his wife, though he is involved in closing the monasteries. Cromwell’s later success and closeness to the Henry VIII is rewarded by the marriage of his son Gregory to Elizabeth Seymour, sister to the king’s third wife, Jane. Elizabeth Cromwell didn’t live to see this triumph or her husband’s fall from favor. McGrath enriches the novel with the sights, sounds and smells of Tudor London. Elizabeth Cromwell’s knowledge of the properties of different cloth goods — the color, texture, drape — is among of the most interesting information imparted. The strength of Carol McGrath’s work is her attention to detail and her ability to create portraits of strong women. 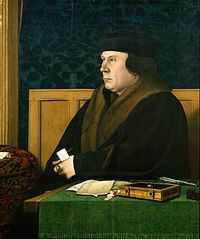 Thomas Cromwell by Hans Holbein. Public Domain. 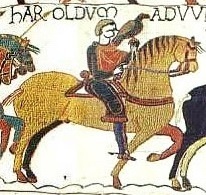 King Harold in the Bayeux Tapestry. Public Domain. Carol McGrath. “The Woman in the Shadows. Carol McGrath Introduces her New Novel.” Historical Novel Society. Aug. 29, 2017. Elisabeth Storrs. “On Inspiration: Interview with Carol McGrath. Oct. 1, 2017.